Soft “hoo-ee.” Song is series of loud bubbling phrases and trills, mixed with harsher notes. Description: Breeding male is black overall with white patch on wings and under tip of tail. 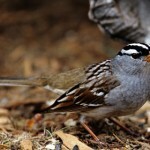 Winter male is streaked grayish-brown above; white below with brown streaking and buffy sides; white eye line and faint mustache stripe; black on chin. Female is similar to winter male but lacks black on chin. Both sexes have short tail and heavy bluish-gray bill. Habitat: Mixed short-grass prairie, sage-dominated areas, taller grasses with scattered shrubs, along weedy roadsides, retired croplands, and in alfalfa and clover fields. 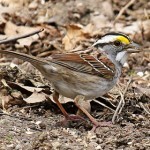 Where in Nebraska: Common spring and fall migrant and summer resident in western and central Nebraska. Rare breeder further east. 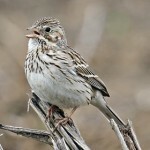 Lark Buntings like to drink from water sources often provided as wells for livestock in farmland. 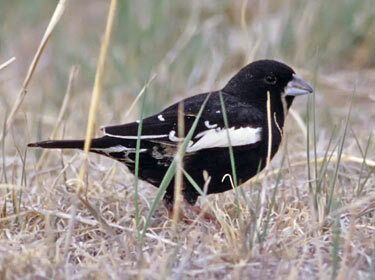 Highly gregarious outside the breeding season, and also colonial even during nesting period.